Walter Turpin was born in 1858 in Bethnal Green in the ancient parish of Stepney then in Middlesex, the son of John and Martha Turpin. In all he was a teacher for 50 years. In 1871, as recorded in the census, John was a clerk living at 5, Warner Place in Bethnal Green. Walter’s older siblings, Alfred, 20, was also a clerk; Martha, 18, was a school mistress; and Elizabeth, 16, was a trimming maker whilst Walter, 13, was still at school. Perhaps Martha was a role model for his future career! According to his obituary in Hertfordshire Mercury, he began his teaching career in this year at the British School in Hackney, presumably as a pupil teacher. Gaining a Queen’s Scholarship in 1876, at the age of 18, he went to the well-known Borough Road Training College, and after two years qualified as a fully trained teacher. On leaving college he secured an appointment under the London School Board, but some eighteen months later his health gave way under the strain of hard work. After his tiring day in school he spent his evenings as instructor at a technical institute in the Strand, and this proved too much for him. In the autumn of 1879 he embarked for New Zealand, and on arriving there in the New Year of 1880 he was at once recognised by the New Zealand Government, granted a full certificate, and commenced teaching in the goldfields district of the province of Otago. In a few months he was transferred to Dunedin, and subsequently was appointed second master of the Port Chalmers High School, at that time the largest secondary school in the then colony. The work here was so arduous that his health again broke down, and at the end of 1886 he returned to England. By this time his father, John, then 65, assisted by his wife, Martha, 61, along with Martha, 28, and Elizabeth, 25, was housekeeper of offices in 34/35 Leadenhall Street, where they had been since at least 1881. The long sea voyage back to England restored Walter, and in 1887 he resumed his scholastic duties, taking charge of the British School at Woodbridge, Suffolk, and afterwards the Board school, Great Totham, Essex. In February, 1889, he came to Hertford as Head Teacher of Cowbridge School. He married Louisa (nee Oldridge), in Greenwich in 1890. Louisa was two years older than Walter and had been born in Deptford. 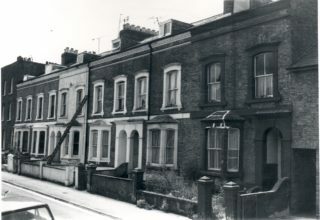 Walter Frank, their first son, was born in February the following year when the family was living at 4, Villiers Street where Walter was to spend the rest of his life. In 1891, a few months after Walter, Junior had been born, John Turpin died at the age of 75, whilst he was still the housekeeper in Leadenhall Street. Martha died two years later, aged 73, and since her death was registered in Hackney she had, presumably, moved away from the City. By 1901 Walter and Louisa had a second son, Royland Alfred and Nelly Wells, Walter’s twelve years old niece from Fratton, Portsmouth was living with them. By 1911 Walter and Louisa were still living at 4, Villiers Street with Royland who, at 16, was a dental mechanic. Walter Frank, now 20, was working as a clerk for Union Bank of Australia and living at 16, Elsinor Road, Forest Hill, Lewisham with his uncle and auntie, Henry James Tuckwell, 54, a railway messenger and Amelia Elizabeth (Louisa’s sister), 53. Frank Tuckwell, 25, a railway signalman and Amelia’s father, Robert Thomas Oldridge, 90, a retired shipwright in Chatham docks, were also living there. Unfortunately Walter Frank died on Monday, 10th December 1917 on the Western front in the Somme, fighting in the London regiment. He was aged 27 and is commemorated on Pier and Face 12 C, Thiepval Memorial, as Pte, Walter Frank Turpin, 760546, 1st/28th Battalion, London Regt (Artists’ Rifles) died, Monday, 10th December 1917, Somme, France. His name also appears on the War Memorial in Parliament Square, Hertford. This was a great blow to Walter, senior, from which, apparently, he never really recovered. 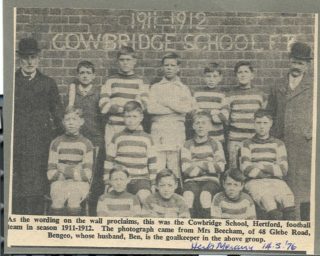 Walter moved with the boys from Cowbridge School to Port Vale School when the latter was opened in April 1915. He retired from this post in December, 1922 when he was given a comfortable armchair as a token of affection and esteem from the teachers and scholars of Port Vale and Cowbridge Schools, and a gold watch from the Managers and past scholars. Mr. William Graveson, the Chairman of the Managers, in presenting the gold watch, said that whilst they were glad to show their appreciation of Mr. Turpin’s long and faithful services, they felt great regret that his post as headmaster had terminated. One of the redeeming features of a schoolmaster’s life was that, although it did not bring great emoluments, it gave the opportunity of helping the lives of the young in a way that scarcely anyone else had. The gift was but a small token of the very warm regard in which Mr. Turpin was held by all with whom he had come in contact. Unfortunately he had not been in the best of health for some time, and in March the following year, The Hertfordshire Mercury reports,he was out and about as usual on Saturday morning. About 11 o’clock he was in the town, and on returning home just before 12, he suddenly expired in his chair, (presumably the chair he had been given when he retired), the cause of death being cerebral haemorrhage. Walter was a keen, capable chess player who played for the County team on a number of occasions and once he reached the semi-final of the county individual championship. He had been the moving spirit in the re-forming of the Hertford Club after the War and was Honorary Secretary and Treasurer of the club at the time of his death. Walter was also a keen and capable member of the Hertford Bowls club, and for many years a member of the choir at the Congregational Church in Cowbridge, now the United Reformed Church. Mr. Edwards, Assistant Master at Port Vale School, who had been with Walter for sixteen years said that Mr Turpin had always taken the deepest interest individually in the boys and girls who had passed through the schools; he carefully studied their peculiarities, their temperaments, their good points, their failings, and even continued his interest in them after they had left school. Louisa died at the age of 80 in 1936 in Bedford. This page was added on 04/10/2013.